I think there is way more to the US version than you stated above. I have yet to see the movie, yet I feel that there is something bittersweet about the US poster as well. Who would read love notes with your sweetie right next to you? You probably wouldn’t. You see. . . I believe the designer created the poster with the thought that Swank’s character is imagining him there. Even the way her head is tilted leads me to that conclusion. He’s whispering the words from the letters in her ear. My vote’s for the French poster. As you said, Gus, I’m getting a cavity already from the US poster. 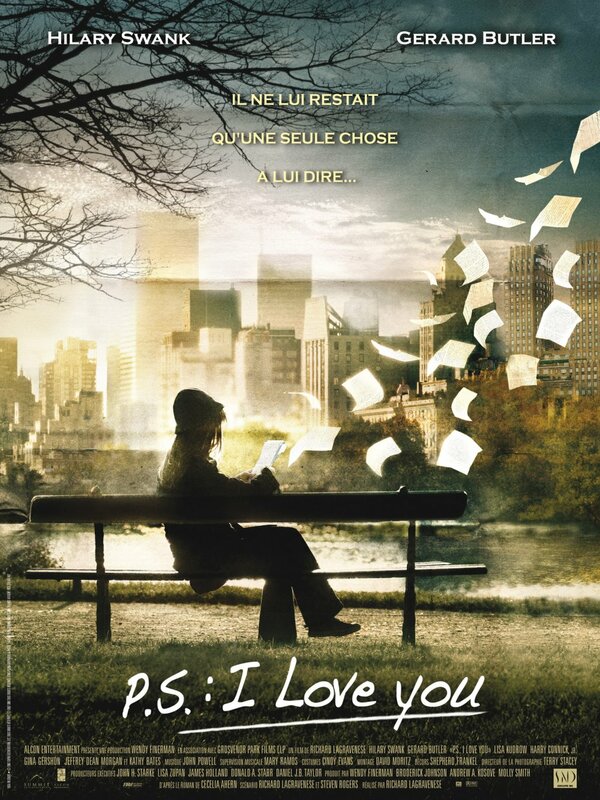 I love the tone of the French poster–sad but also beautiful. The only thing that annoys me is way the letters are flying away. It looks too darn neat. Kelly, I think that is a very astute reading of the poster, but it’s all very very subtle. There is no way I could have noticed the significance of these details if I didn’t already know the story, and even if you know what the film is about I think it’s still easy to miss them. And even in that interpretation it still feels like a more upbeat take on the premise. But like I said, I think it’s a fine poster. Both posters are nice but I believe the french one represents what happens in the movie better than the other one.